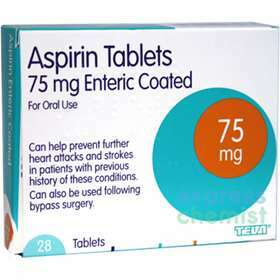 Aspirin tablets can help prevent further heart attacks and strokes in patients with previous history of these conditions and they can also be used following bypass surgery. The usual dose for long-term use is one or two tablets once daily. In some circumstances, a doctor may advise a higher dose of up to 4 tablets daily. Before commencing therapy, you should consult your doctor who will be able to advise you if this medicine is suitable for your condition. Do not give to children under 16 years of age, unless on the advice of a doctor. If symptoms persist, consult your doctor. Swallow the tablet whole with water - do not chew, cut or crush. See enclosed leaflet for information before use.